The 27.96 metre motor yacht Doris has been listed for sale by Sebastien Clave at Northrop & Johnson. Designed by Fulvio De Simoni, Doris was built in GRP by Italian yard Pershing to RINA class and delivered in 2012 as a Pershing 92 model with the same owner since new. A custom interior uses light wood joinery and cream leather furnishings to create a calm, relaxing ambience accommodating up to 10 guests in four generous cabins. These consist of a master suite, a VIP suite and two twins, all with entertainment systems, Samsung LED television screens and en suite bathroom facilities. Crew quarters sleep three staff aboard this yacht for sale. The main saloon is particularly attractive, offering comfortable seating on furniture in Canaletto and ebony woods, a bar and an entertainment centre including a 61-inch Pioneer plasma television screen on a rise and fall mechanism. True al fresco entertaining and dining is available on the aft deck with built in upholstered seating, a table and weatherproof loudspeakers connected to the saloon entertainment centre. Her aft extends to form a swim platform which is perfect for watersports and allowing younger generations easy access to the water. Up on the sun deck is a set of sun pads that ingeniously convert into a dinette with table, protected from the sun by a large awning. 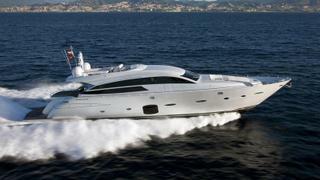 Twin 2,638hp MTU 16V2000M94 diesel engines allow a cruising speed of 36 knots topping out at 42 knots. Doris is asking €3,900,000 with VAT paid.